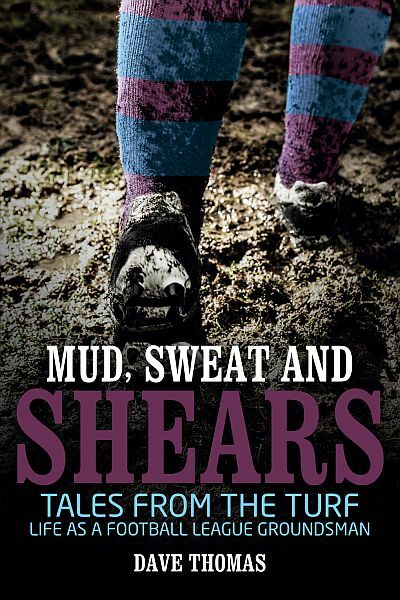 Mud, Sweat and Shears is ostensibly about the experience of Roy Oldfield, an ex-miner who is hired at Turf Moor as assistant groundsman in October 1972, and leaves in 1990 after many years as head groundsman. Self-evidently – apart from any reader obsessed with lawns – Dave Thomas’ latest BFC book wouldn’t be much of a read if it was confined to describing the technicalities of Roy’s work with seeds, rollers, fertiliser, and so on. There is some of this, since Roy is understandably keen to illustrate the reality of being a Football League groundsman before the age of modern pitch technology. But, rather like the modern Desso surface that integrates 20 million synthetic blades of grass into a living pitch, Dave weaves a multitude of other sources in and around Roy’s story to create a rich narrative that is as much a focused social history of the club as it is an employee’s memoir. We start with a brief section about Roy’s early life in the town and his first job as a miner. Anyone reading this under the age of 50 will probably not appreciate the extent to which the coal mining industry contributed to Burnley’s economy – we learn, for example, that the Bank Hall pit alone employed 1,200 when Roy joined as a 16 year-old straight out of school. When he ‘graduates’ to the coal face, he earns more than the First Division footballers then employed at Turf Moor who are still on the £20/week maximum wage. We are reminded of the Keynesian heyday of full employment when, in 1967, Roy decides on a shift of scenery, moving seamlessly from coal face to flower bed, joining the team of gardeners maintaining Burnley’s public parks and being trained up on the job. Working in Scott Park, Roy becomes gradually acquainted with Jimmy Adamson, who walks his dog there. Adamson seems to like something about Roy’s manner and he offers him the opportunity to swap Scott Park for Turf Moor. As the book proceeds, it becomes apparent why Lord is so bothered about Roy’s temperament, for the list of responsibilities placed at his feet is set to inexorably lengthen, something that Lord can no doubt foresee. This causes Roy no end of personal disquiet – his saintly wife Eva sharing his stress at the end of what were often very long working days – but Roy rarely caused a fuss in those early years, particularly when the order came from the boss. For such a controversial figure, Bob Lord comes out of the book well and it is instructive to hear from someone who dealt with him on a regular basis. As far as Roy is concerned, Lord played hard but fair, ruthless with apparent slackers and those with the temerity to resist him head-on, but appreciative of those who put their back into it and did as they were told. Indeed, compared to some of the boardroom figures that followed, Lord treats Roy well. As with many autocrats, Bob Lord couldn’t be told what to do. But he did have his weak spots that could be manipulated, and the way round him was to suggest that something couldn’t be done or wouldn’t be right for a little club like Burnley. That got the hackles rising. As far as he was concerned, Burnley would not suffer by comparison to anyone. Appearances would be kept up and dignity maintained. A big part of this was the ground. Lord took a huge amount of pride in the condition of Turf Moor and would watch Roy at work from his eyrie in the Bob Lord Stand, particularly at the height of summer when the pitch had recovered from the previous campaign and regained its uniform, vivid green complexion. Perhaps reflecting the more deferential times as well as his respect for Lord, Roy strictly toed the chairman’s line. This even extended to gardening at Lord’s house in Read, but the chairman would often express his appreciation, and occasionally gave Roy some extra cash. Included in the book is a 1980 letter Lord sent to BFC staff with their Christmas bonus, thanking them touchingly for their hard work through the year. As a brief aside, one of my father’s friends, Brian, worked for Lord at his meat factory, and told me that Lord expected his employees to help out at the ground on match days or evenings. When Brian ignored Lord’s request to turn up at the Turf one evening to man a turnstile, he was confronted by Lord himself the following morning. What all this reflects is not just the demands of an old-fashioned, no-nonsense small businessman employer, but also the growing impact at the club of the deadly financial pincer movement of declining attendances and rising player wages. Given that Roy joined the club in 1972 and left in 1990, the time frame of the book deals with this decline. While the financial aspect has been well dealt with, less attention has been paid to the impact of this on the famous Turf Moor family ethos. It’s generally assumed that John Bond inherited a time-tested, well-functioning cultural unit at the club and unceremoniously dismantled it. Roy’s insights, however, reveal that while Bond did trash the family ethos once and for all, it had been badly weakened by years of financial struggle that undercut the ability of the people at the club to do their jobs to the standards they had come to expect in the years of plenty. One astonishing story underlines the strength of this ethos at the time that Roy joined, when the glory years of the 1960s were in the recent past, close enough to remain a tangible part of the atmosphere around the club. An elderly Morecambe-based supporter had written in, explaining that he couldn’t get to the Turf anymore, and since he’d heard that the pitch had been ripped up post-season and re-laid, could he possibly have the old bit around the penalty spot where he remembered Jimmy Mac nonchalantly dispatching spot kicks all those years ago? The fact that the old pitch was long gone and in a compost heap somewhere didn’t matter. Roy cut a square of Gawthorpe turf, painted a white spot in the middle and brought it to the Turf Moor office where he and club secretary Albert Maddox parcelled it up to the old chap in Morecambe. There are other little touches of kindness that also resonate. Roy and Eva take an almost parental approach to the apprentices. On hearing a teenage Brian Flynn bemoan the fact that he couldn’t afford a much coveted pair of Adidas boots, Roy takes an old pair and paints three white stripes on them for him. It didn’t, however, take very long for the first small cracks to appear. Much depended on the relationship between Lord and Adamson. As they slowly grew apart, the tensions within the club began to ratchet up. Roy pinpoints the start of the 1974/75 season as the moment at which the difficulties Adamson had in working within Lord’s increasingly stringent budgets began to permeate the working environment throughout the club. Economies were biting hard everywhere. When Roy’s immediate boss, head groundsman John Jameson retired in September 1974, it meant a promotion for Roy but also a noticeable increase in his workload since Jameson was not replaced. His requests for even basic requirements for the job were turned down by the board on the grounds of cost. In exasperation he went to see Maddox, but Burnley’s beleaguered, chain-smoking secretary was in no position to help. At the end of that season, Adamson’s last full campaign as manager, Roy handed in his notice and went back to the far less stressful task of tending Burnley’s public parks, but he was tempted back to the Turf in the summer of 1977 after a personal request from manager Harry Potts and first-team trainer Brian Miller. He returned to find the club in a downward spiral and with morale badly affected. The malaise was reflected, Roy felt, in the attitude of some of the directors, which became a perennial cause for complaint, particularly when he was dragged away from pitch duties to perform menial tasks like changing light bulbs or seeing to the rubbish. Some folk would have just shrugged and got on with it, but the thing with Roy was that he took with utmost seriousness the condition of the playing surface. For him, it was the raison d’être of his working life; job satisfaction came from beating the weather to get the game on, and receiving subsequent praise from managers, players and referees for the quality of the surface. Anything that needlessly detracted him from this task undermined, as he saw it, his primary function at the club, the task that earned him his wage. Roy’s diaries form the structure of the middle part of the book, as he details his battles with the East Lancashire climate at a time when we still used to experience proper, sub-zero winters. The very fact that Roy kept such meticulous records of what he did to try and keep the pitch playable is testament to his whole approach, and the very real pressure that he felt – especially when poor weather led to fixture congestion – is palpable in his diary entries. Directors over-ruling him to play meaningless reserve fixtures are a particular source of quiet fury. But what comes through more than anything is the sheer grind and physical toil of maintaining a grass pitch through a winter season in a place like Burnley, where, as Roy puts it, nothing germinates after October. You might think it was a hopeless cause, but there is no doubt that the expertise, dedication and attention to detail that Roy put into his job made a real difference. At one point he receives a call for help from Ewood Park, where the pitch is in a terrible state compared to the surface he has engineered at the Turf. He goes over to have a look and discovers they are using the wrong kind of sand. It’s not a mistake Roy would have made. Given the relentlessness of the rain in Burnley, it’s no surprise to find that much of the commentary in Roy’s diaries are rather gloomy observations about the state of the surface and the sheer amount of time it took to repair after a game. Surviving this groundsman’s weekly cycle – repair surface, prepare surface, watch surface get wrecked – must surely require a certain kind of robust psychological constitution. On numerous occasions Roy finds himself out there on his own, long after spectators, players and directors have gone home, hands blue with cold as he replaces divots in the pouring rain under the illumination of a single floodlight. It would test the mettle of a Spartan. Page upon page of all this and you’d have BFC’s first misery memoir, but Dave skilfully weaves anecdotes and some cutting analysis into the chronology to keep the narrative moving along at a clip. By the time we get to the end of the Bob Lord era, the operation behind the scenes is becoming skeletal. There is simply no money for anything beyond the absolute basics. At the end of the 1980/81 season, an entire month of work to re-level and re-seed the pitch is completed by Roy and the managerial team – Miller, Casper, Pointer and Bellamy – who bring in their own tools and ferry soil all day from Gawthorpe in a small van because the club only possesses two shovels and can’t afford a lorry load of top soil to be delivered to the ground. It’s an eye-opening picture of a once mighty club reduced to a homespun austerity, kept going only by the conscientiousness of a staff fuelled by a fond and fierce memory of what the club had been, rather than the objective reality of what it had become. The death of Lord heralded in a new regime at the club which initially appeared to make some progress. One bonus for Roy was a new wheelbarrow, paid for by the newly-established BFC official supporters’ club, an organisation whose existence Lord had long prohibited. When, in December 1981, the new chairman, John Jackson, had helped to clear snow from the pitch, there were even hopes that the corrosive them-and-us attitude between the board and the club’s rank-and-file employees might be repaired. In Colin Sanderson, Roy at last found a director with the decency to treat him with the respect that his professionalism deserved. The outcome of the 1981/82 season seemed to herald a new beginning on the pitch as well, all of which make it one of the most interesting periods in the modern history of the club. It is in the corresponding section of the book – from 1982 to around 1986 – that Dave brings in more sources, one of which is the private and riveting diary of director Derek Gill. There are some revealing insights into the 1982 promotion, including Casper’s recollection, at the Roots Hall denouement, of Jackson sauntering along the touchline with the game (and promotion) in the bag, bragging to him and Miller that he’d only been chairman six months and the club was already on its way back. Casper presciently saw this as a sign that Jackson was out for glory and would lose little sleep in cutting out the whole family club, Claret-till-I-die approach for something more in keeping with his vision of the dynamic QC leading Burnley back into the big time of British football. For Roy, Jackson’s elevation to the chair had mixed results. There was a bigger budget for the pitch at the end of the season, but the contractors employed to renovate it botched the job, with matters not helped by the well-meaning Casper flattening the pitch with a heavy roller borrowed from the cricket club! Returning from holiday expecting to find the pitch professionally renovated, Roy instead faced a summer’s worth of work to put it right. This squad stood head and shoulders above the standards of the Third Division…Ready and eager to do battle were Brian Laws, Lee Dixon and Willie Donachie…Try to find me another Third Division club back then with three full-backs of that quality and I assure you it will be a long and fruitless search. When I think of some of their replacements for whom we paid fees, I know I was in the centre of a nut house. For Roy, a very welcome relief from the mental stress of the job was a shared mug of tea with a famous football figure of the day, and the pages of Mud, Sweat and Shears are visited intermittently by some genuine legends. Perhaps surprisingly, Roy was impressed by Bond, who made a point of apologising in advance when he scheduled a training session on the pitch, and who regularly complimented him on the playing surface. For Roy, the measure of the football man was the extent to which success and fame had not eroded the polite egalitarianism between those who earn their living from the game in whatever capacity, and Bond passed this test effortlessly. My favourite celebrity moment in the book derives not from a footballer but a cricketer: Fred Trueman, who visits the Turf in his post-playing career as a journalist and drags Roy into the boardroom for a post-match drink with the suits, bluffly dismissing Roy’s protests that Bob Lord would kill him for impunity. With Bond gone and the money from the 82/83 Cup runs all blown, the rest of Roy’s story takes place against a backdrop of Osborne-like austerity at the club. The 1984/85 season ends in relegation to the Fourth Division, and at the end of the following season the club is more or less bankrupt, £650,000 in debt and losing £9,000 a week. It is at this point that a fork in the road emerged when Derek Gill approached the board with a rescue plan that would have guaranteed some desperately-needed investment. The snag was that Frank Teasdale was required to step aside after just one season in the chair. It’s often been said that there was only one thing that Teasdale loved more than Burnley FC and that was being chairman of Burnley FC, and this moment was a case in point: Teasdale couldn’t argue that Gill wasn’t the right man for the job, one of his favourite defensive manoeuvres in future years. Instead, Crap Frank hastened, cap-in-hand, to the TSB and secured the bank’s support for another year (and his position in the chair) but at an almost fatal price – a punitive playing budget that nearly cost the club its Football League status. Roy’s diary drips with contempt, no more so than when the board sanction two meaningless fixtures on a fragile pitch, one being a game of American Football. There was, at least, one consolation with the return of some old friends to the Turf. George Bray became the kit man, and in the summer of 1986, Brian Miller returned for a second stint in the manager’s chair. Arthur Bellamy’s unorthodox promotion from Gawthorpe groundsman to assistant manager also cheered Roy, as he figured that Arthur would be more sympathetic to his needs as a groundsman. After the disastrous experimentation with ‘outsiders’, the players were once more managed by Clarets. This didn’t, however, alleviate the core problem of penury. The great boardroom survivor of those days, Clive Holt, argues that everyone, not just Roy, was under pressure due to a lack of money, but Holt’s case is undermined when Roy visits Bury FC – hardly the most opulent of outfits – to borrow a spraying machine. At Gigg Lane, Roy finds a much happier footballing family, with ground staff valued and supplied with the modern machinery needed to do the job properly. By the end of Roy’s time at the club, the years of non-investment had taken their toll. The pitches at Gawthorpe were so poor that the first team trained at Turf Moor, leading Roy to note in his diary that they might as well sell Gawthorpe for all the use they made of it. He left at the end of the 1989/90 season for a groundsman’s job at the ambitious but short-lived Burnley Bank Hall FC, where he was, incredibly, paid more than his leaving salary at Turf Moor. Imagine today the groundsman at Padiham FC on a better wage than his counterpart at Burnley and you have some idea of the levels to which the club had sunk in the 1980s. Ask any historian about the importance of sources, and they will tell you never to under-estimate the value of those who were simply in the room. But it is unusual for these behind-the-scenes toilers to have their moment in the spotlight. Sometimes they are reluctant to talk when handed the microphone – as we discovered when we once interviewed Albert Maddox for this magazine. Mud, Sweat and Shears works so well because the two people behind it have complementary aims: Roy is happy to reveal what he experienced and to share what he wrote; Dave has recognised the value of Roy’s testimony, not just to tell a historic tale but also to illustrate by means of contrast just how the club has been transformed by the millions of pounds of Premier League money. It’s an old chestnut for the older ones to tell the younger ones that they have no idea how lucky they are – such exercises always run the risk of sounding bitter or churlish, and they often under-estimate the challenges that face the younger generations. But in the face of such potential pitfalls, Mud, Sweat and Shears is a fine example of how to look back with exactly the right mix of emotions – not just anger, but also fondness, a sense of belonging, and the satisfaction of a job done well. This review was previously published in the London Clarets magazine.